I suppose that most people don’t think of butterflies when they think of Burgess Park. But they should! Already this year (by late March) I have seen a Small Tortoiseshell, a Small White, a couple of Commas and a couple of Brimstones. Over the past few years, I have spotted no fewer than 16 different types of butterfly in the park. On one spectacular sunny July day, I saw more than 160 butterflies of 10 different species, plus a couple of day-flying moths. 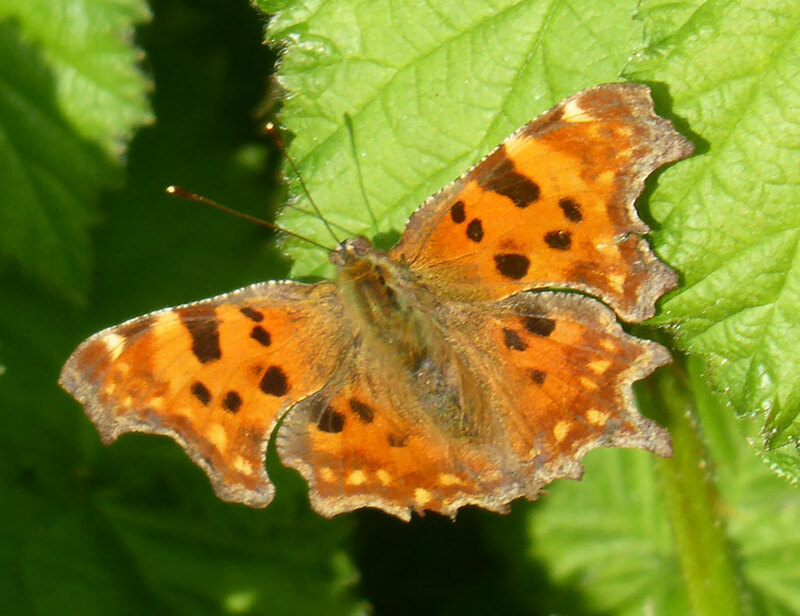 The Comma is a harbinger of spring, often seen in April. They spend the winter hibernating as adults and they reappear as soon as the weather warms up. This one was in the wooded area north of the lake – a favoured spot. The caterpillars used to feed on hops, but now have a taste for nettles and this has helped them increase their range and abundance in recent years. 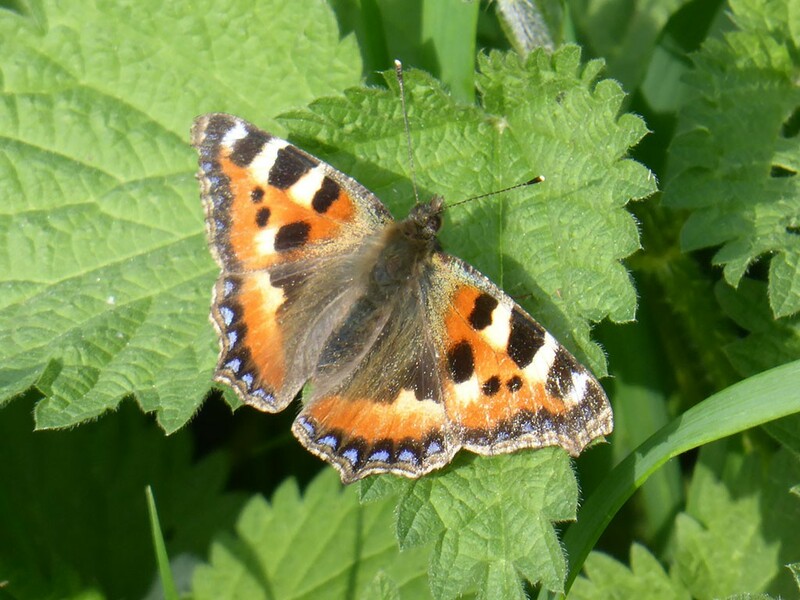 The Small Tortoiseshell also hibernates as an adult. This one was spotted in the middle of the Park by some brambles in April. The caterpillars feed on nettles, so it’s important that we don’t tidy the nettles away! We used to see a lot more of these butterflies. Nobody really knows why they have crashed in numbers so quickly. 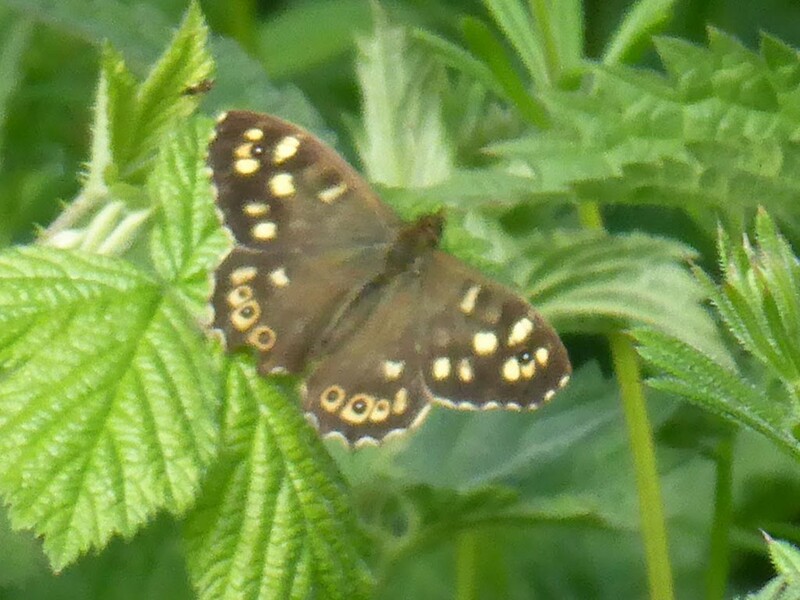 A Speckled Wood in the Glengall Wharf area in April. They like the semi-wooded areas and enjoy dappled sunlight. A Sitochroa verticalis moth (this has no English name) on one of the big mounds in June when many of the flowers were in bloom. Also around at that time were lots of Burnet Companion and Silver-Y moths. 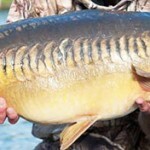 The latter is a migrant that can appear in London in big numbers. 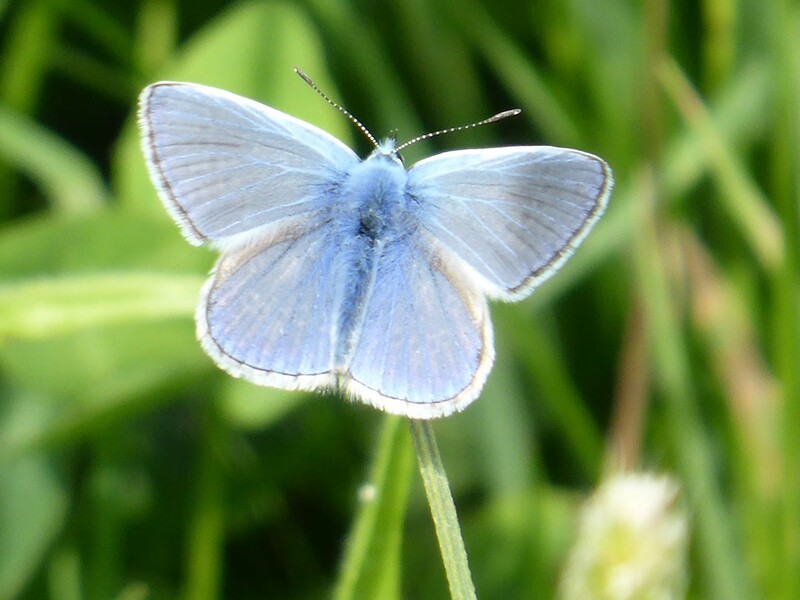 One of many Common Blue butterflies seen on the big mounds in June last year. 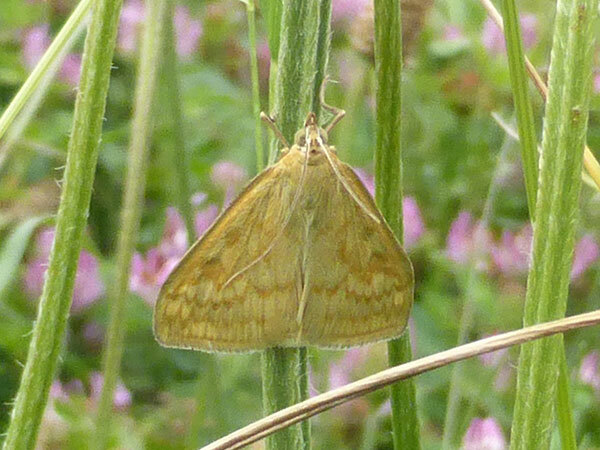 The caterpillars feed on Bird’s-foot Trefoil which is present here. 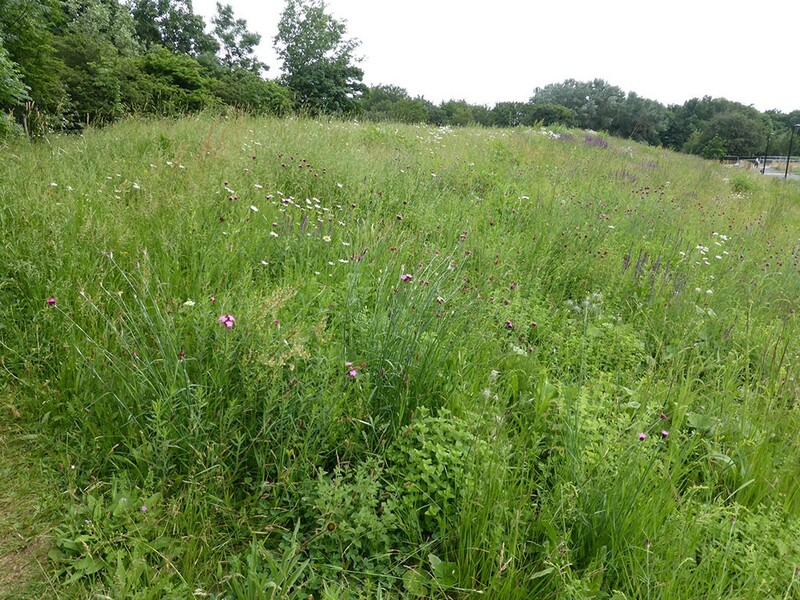 The big mounds are often teeming with insect life, a result of the many wild flowers present. 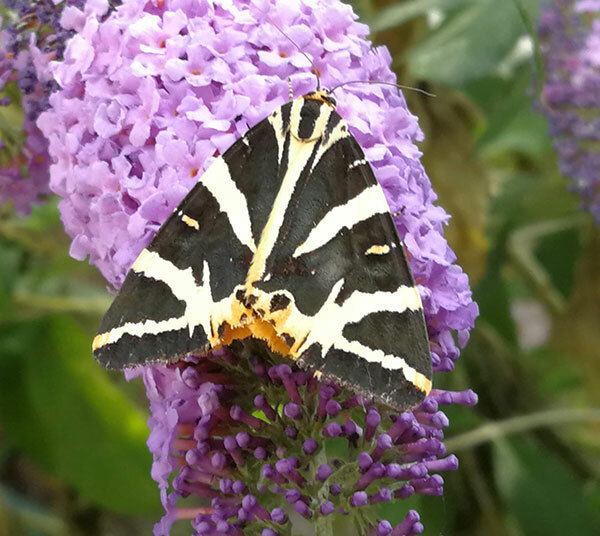 The spectacular Jersey Tiger moth can be seen flying in the Park in July and August. This photo is from Kennington, about a mile away. This used to be restricted to the south coast, but is now spreading rapidly. 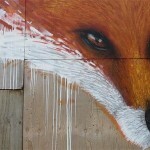 It can be seen all over south London. 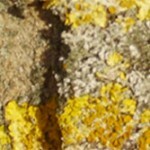 Because it is colourful and flies by day, it’s often mistaken for a butterfly. 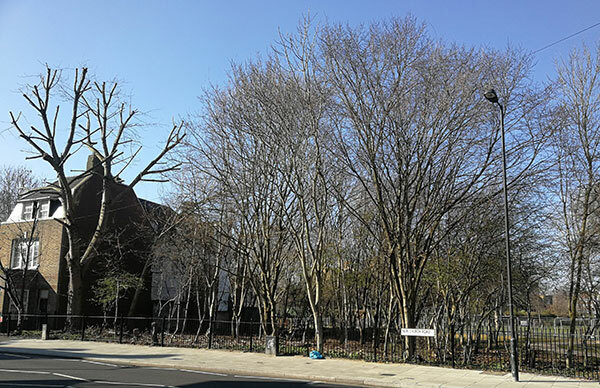 Elm trees by New Church Road. If you are lucky, you might see pairs of male White-letter Hairstreaks spiralling in mock combat at the top of the canopy. I haven’t seen any Painted Lady, Peacock or Ringlet butterflies in Burgess Park, but I would be surprised if they were not present, as they have been seen at Nunhead Cemetery (3km away). The Painted Lady, which is a migrant species, was also seen at Walworth Garden (1km away). There may be Purple Hairstreaks on the oak trees by Waite Street. Moths present include: Jersey Tiger, Six Spot Burnet, Burnet Companion, Silver-Y and Sitochroa verticalis. All this goes to show what a wonderful place Burgess Park is for butterflies. 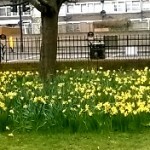 I know that Southwark Council are keen to make it even better. 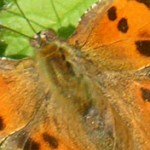 Butterfly Conservation has started a ‘BIG City Butterflies’ project, supported by the National Lottery Heritage Fund. 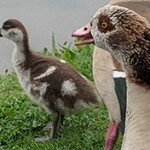 This aims to get people to engage with the green spaces near them and to discover the wildlife that’s under their noses. 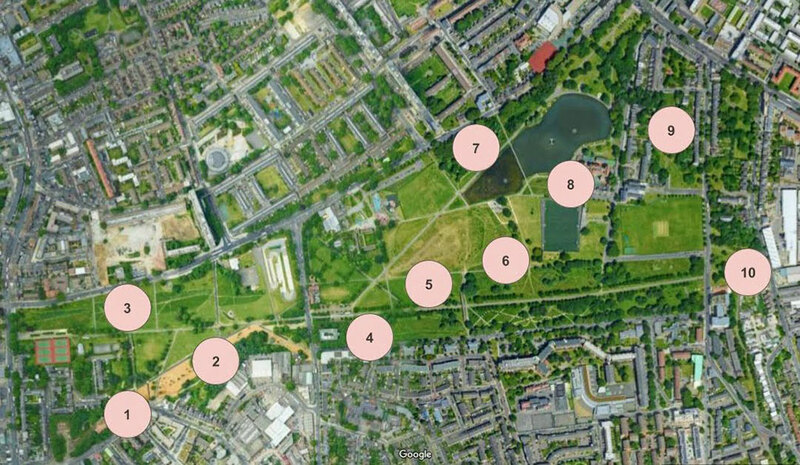 We’ll be using Burgess Park as one of our key sites in SW London. It’s early days, but you can read more about Big City Butterflies here.